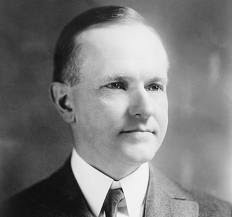 February 12, 1924: President Calvin Coolidge who is known as the 'Silent Cal', for the first time make his political speech on the radio. The president radio speech was from New York and broadcast on five radio station. Millions people was heard the speech. Although known as a quiet and even reclusive person, but he was the most friendly president with medium. He used radio, the newest medium at that time, to spread his mind, idea, regulation etc to the people of US. He was available for press, he made 529 press conference and regular meeting with reporters along his career as US President.